Muthuvel Karunanidhi was an Indian writer and politician who served as a Chief Minister of Tamil Nadu for five terms and twenty years between 1969 and 2011. He was a long-standing leader of the Dravidian Movement and ten-times president of the Dravida Munnetra Kazhagam Political party. Before entering into politics he worked in the Tamil Film Industry as a screenwriter. He has also made contributions to Tamil literature, having written stories, plays, novels, and a multiple-volume memoir. He was popularly referred to as Kalaignar or the artist. Karunanidhi married three times. His first wife was Padmavathi and they had a son M.K.Muthu, who was briefly active in Tamil films and politics. Padmavathi died early, and Karunanidhi married Dayalu Ammal with whom he had three sons, M.K.Alagiri, M.K.Stalinand, M.K.Tamilarasu and M. K.,and a daughter, M. K. Selvi. Alagiri and Stalin are active in state politics and competed to be their father’s political successors, before Stalin prevailed. Tamilarasu is a businessman and film-producer and campaigner for his father and his party; Selvi campaigned for Karunanidhi elections too. With his third wife, Rajathi Ammal, Karunanidhi had a daughter, Kanimozhi, who is seen as his literary heir. 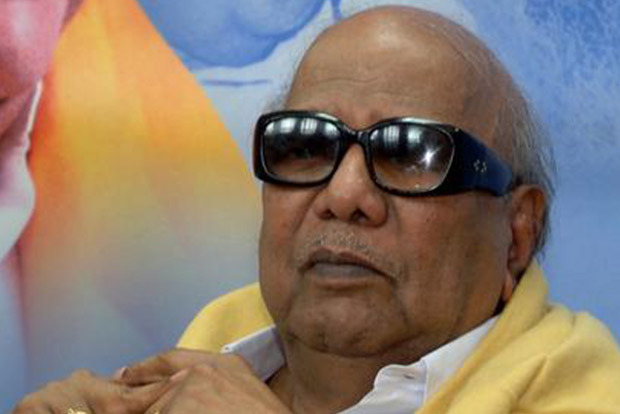 Karunanidhi began his career as a screenwriter in the Tamil film industry. His first movie as screen writer was Rajakumari produced by Coimbatore based Jupiter Pictures directed by A.S.A.Sami starring M.G.Ramachandran. Karunanidhi entered politics at the age of 14, A speech by Alagiriswamii of the Justice Party inspired him, and he participated in Anti-Hindi agitations. He founded an organisation for the local youth of his locality. He circulated a handwritten newspaper called Manavar Nesan to its members. Later he founded a first student wing of the Dravidan Movement for student organisation called Tamil Nadu Tamil Manavar Mandram. Karunanidhi involved himself and the student community in social work with other members. Here he started a newspaper for its members, which grew into Murasoli, the DMK party’s official newspaper. At the age of 33, Karunanidhi entered into the Tamil Nadu assembly by winning the Kulithalai seat in the 1957 election. He became the DMK treasurer in 1961 and In the year 1962,He bacame deputy leader of opposition in the state assembly and when the DMK came to power in 1967, he became the Minister for Public Works. When Annadurai expired in 1969, Karunanidhi became the Chief Minister Of Tamil Nadu and the first leader of DMK. From October 2016, Karunanidhi’s health was in poor condition and minimized his political activities and public appearances, with the last one being on his 94th birthday on 3 June 2018. On 28 July 2018, Karunanidhi’s health deteriorated and became “extremely critical and unstable”, and he was admitted at Kauvery Hospital in Chennai for treatment. Due to Age Related Illness, Multiple Organ Failure took place, and he died there at 6:10 p.m. on 7 August 2018. Annamalai University awarded him an honorary doctorate in 1971. He was awarded “Raja Rajan Award” by Tamil University, Thanjavur for his book Thenpandi Singam. On 15 December 2006, the Governor of Tamil Nadu and the Chancellor of Madurai Kamaraj University, Surjit Singh Barnala conferred an honorary doctorate on the Chief Minister on the occasion of the 40th annual convocation. In June 2007, the Tamil Nadu Muslim Makkal Katchi announced that it would confer the title “Friend of the Muslim Community” (Yaaran-E-Millath) upon M. Karunanidhi. Muthuvel Karunanidhi was an Indian writer and politician who served as a Chief Minister of Tamil Nadu for five terms and twenty years between 1969 and 2011.